Recent rumours of a new Toys to Life product from Lego has the internet buzzing and has made my kids put on their inventor hats. 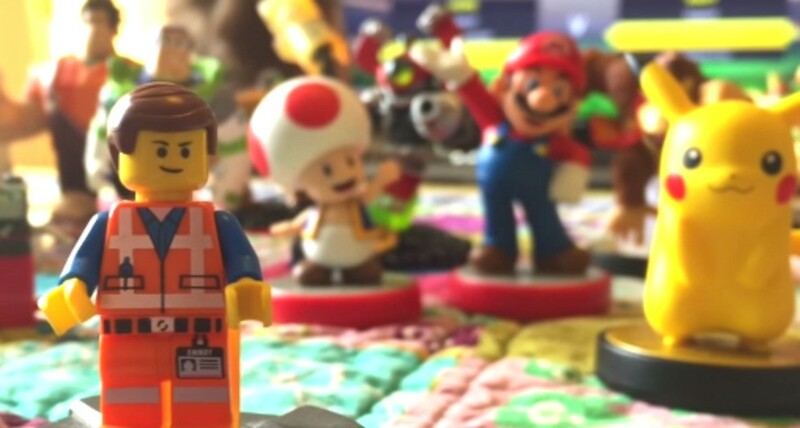 If you missed it, this is the news that Warner will team up with Lego for a new title called Lego Dimensions to compete with Skylanders, Disney Infinity and amiibo. While details are scant it seems this will likely follow up on previous good work by developer TT Games. The common conjecture is that this will add in a Toys to Life element alongside the wider Lego video game experience which has been honed over the past few years. I noticed my kids had been playing their own made-up version of the game (as they imagine it). Once they'd moved on to play some FIFA I jumped in and filmed their two creations. It wasn't until seeing what the reality of a smart Lego mini figure might look like - and have it alongside the other Toys to Life counterparts - that I started to take the rumours seriously. If nothing else, the idea of having a Lego character that could be upgraded and save progress like an amiibo was something my kids found really exciting. We believe the digital gaming space is a huge amplifier of the physical play experience, but we don't want the digital play experience to cannibalise the physical play. We continue to explore many different digital opportunities as we are doing right now. Whether this continued exploration of digital angles has brought Lego to the point of entering the Toys to Life race remains to be seen. One potential challenge will be around franchises. Many of the Lego cross-overs are with a Disney licence. It's hard to imagine the house of mouse signing off on a Lego Dimensions competitor to Disney Infinity. This led my son to wonder whether "we could have a Lego amiibo" which actually isn't as far-fetched as it sounds. With Nintendo's history of publishing the Wii U and 3DS exclusive of Lego City Undercover it's not a big jump to imagine updating this offering with special Lego amiibos. Our biggest challenge is to continue to stay close to our core audience and understand where they are moving. For us to constantly to be almost paranoid to be sharp enough to our key stakeholders, children. Toys to Life - whether that is amiibo, Skylanders or Infinity - is certainly one trend too big (and too profitable) to ignore if you are in the toy business to make money. I would buy something like this in a heartbeat. LEGO is spelt in all caps. Anyway, they would have to function as LEGO as well as toys to life. If you had any idea of how much I've spent on LEGO over the past 8 years. Thank goodness for pay cheques. If they do a dc comics game like a lego batman with an infinity type sandbox Id be a first day buyer for sure. I think this is a given. LEGO is currently unstoppable, and the toys to life genre is in it's prime. LEGO makes everyhting form cheap packets to Mindstorm so 1 more line of toy swon't hurt them any. AND they alreadymake about 3 videogames a year. It's a natch, match made in heaven. But what I really want is a Dragon Ball toys to life game. Or at the very least Goku, Vegeta, Cell and Frieza amiibo which unlocks their respective DLC in SSB. @Damo wikipedia isn't always right. Though it wouldn't have mass-market appeal, I'd love to see these games explore original themes like the Pirates and Islanders, etc. Perhaps even classic sets can be reimagined? The constant use of licensed content has become less interesting to me at this point. @RCMADIAX As far as I have read, it's actually around 5%. Well then Wikipedia is wrong. Words like LEGO, DUPLO, BIONICLE, and MINDSTORMS are usually always written in capital letters. I think NINJAGO also but I'm unsure on that one. @Boidoh A lot of companies like to write their brand (and sub-brands) in capitals, as it makes them seem more important. You would not believe the amount of press releases we get where EVERY SINGLE TRADEMARKED NAME is WRITTEN IN CAPITALS. Even THE names of CHARACTERS. It is REALLY annoying. So yeah, Lego is lower-case in my eyes. @Pianist88 A lego spaceset game with the wee blue astronaut guy from the film would be great.hopefully they could use characters from the film to get kids interested in the non licenced stuff. As a lego fan, I'm hoping it's just a NFC chip in collectable minifigure series, I don't want a stiff unplayable statue! That goes against LEGO and if I wanted that, I'd order some Galidor.